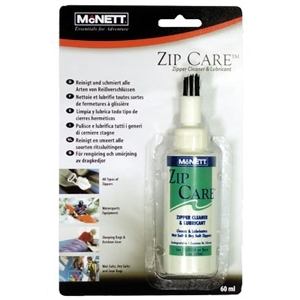 THE ULTIMATE ZIPPER CARE FOR PLASTIC, NYLON OR METAL ZIPPERS. UNIQUE BRUSH TOP ENABLES THE CLEANER TO BE DELIVERED BETWEEN THE TEETH & PHYSICALLY REMOVES HARMFUL DIRT, SAND AND SALT DEPOSITS THAT CAN JAM THE ZIPPER. Supplied as a Single 60ml Bottle with Brush on Top.